Donald Martiny might not be a household name in Asia (yet), but having painted his way to the lobby of the south entrance of One World Trade Centre in New York, the North Carolina-based artist’s massive sculptural brushstroke paintings never go unnoticed no matter where they are. The scale and the detail of Donald’s works are so impressive that they've changed the way audiences interact with art, thanks to their heavily textured and three-dimensional shapes, which he creates using tools like brooms, mops and his own hands. Tell us about your passion for art, how did it all start? My passion for art began at a very early age. I believe it began when I was in kindergarten. While I loved to draw and was fascinated with images, I believe the most powerful thing for me was colour. I was very excited by the pure colours of paints and crayons. It affected me in a powerful and visceral way, and it still does. As I grew older, I was hungry to see paintings but we didn’t live near any art museums, so I relied on art books and magazines that I found in the local library. I visited an art museum for the first time when I was around 14 years old, the Art Institute of Chicago, and I was astounded by the scale of the works. It was tremendously thrilling. Your works look like strokes from the world’s largest paintbrush, how did you come up with such a unique medium? Have you noticed when people respond to a work of art in a gallery or museum, they often walk up close to it? I believe we do that because we want to become involved in the process of creating the art. 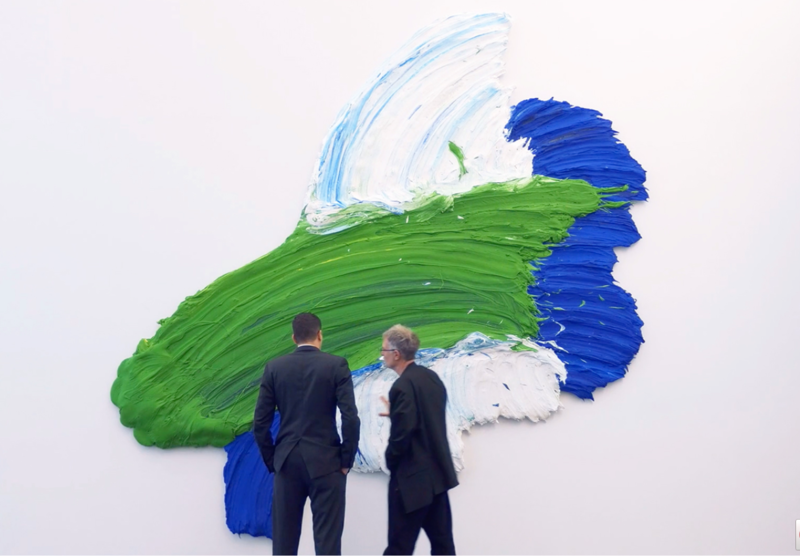 We want to see and feel the brushstrokes. There is so much information in the brushwork: whether or not the artist painted from the wrist or the shoulder, the artist was right or left-handed, he painted fast or slow, etc. By making large brushstrokes, the viewer is immediately placed up close and has a better opportunity to have an intimate relationship with the work. An artist’s brushstrokes are as unique as fingerprints, as they represent the artist’s energy and emotions. What kind of emotions are packed in your works? My paintings are actual authentic gestures. These brushstrokes are very much me and I want to be present in the works as honestly and authentically as I can be. They are a record of my physicality at a specific point in time. My paintings celebrate life, hope, kindness and love. The paint you use in your works is unusual, can you tell us about it? I make my own paint. It is a water-based polymer saturated with pigment. Sometimes I add microbubbles into the mixture to make the paintings lighter or more workable. Once dry, the paintings are very light and hard. It took many years to figure out how to make a paint that could do what I want it to do, as oil paint would be far too brittle and acrylic paint would be too rubbery and floppy. Of all the paintings you’ve done, do you have a favourite? My favourite painting is always the last one I've made. My art practice is a journey. I don’t know if the paintings I am working on today are better than the works I made years ago, but they are where I am now. I am working on a number of projects. I just finished a very large work that I will be installing in Cologne, Germany. I have an exhibition opening in Milan at the end of November, and two museum exhibitions scheduled for 2018—one in Louisiana, USA and one in Germany. I am also working on a large-scale painting that will be installed in a public space in Chapel Hill, North Carolina.